So if you've read my blog at all, you may have noticed that I have a slight obsession with sew-alongs. I just can't seem to help myself. Here's a look at the upcoming events in the sewing blog world. Flip This Pattern - This is a year long event featuring a different pattern each month starting in June, with the Bubble Pocket Shorts. Giveaways, Voting, Sew Along linkies; just about everything you could wish for in a sewing event. 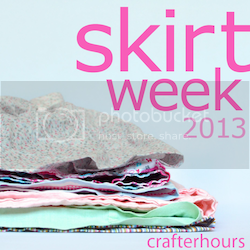 Skirt Week - This is the second event I am participating in June. I've already entered one skirt into the competition, and I'm thinking about doing a second (You can enter up to three skirts per category). Update - I will also be sewing up a pencil skirt for the Stitch Once, Rip Twice challenge. Thanks for the tip Amy. What June events are you excited about. Did I miss anything?